Kauai is defined by its spectacular scenery, secluded beaches, and laid back personality. Although only 25 miles long and 33 miles wide, the island contains a remarkable variety of landscapes, attractions and weather. Given this diversity, deciding where to stay in Kauai deserves some careful consideration. The following guide will help you choose the region that suites you the best. It's convenient to separate Kauai into 4 regions - the North, East, South, and West coasts. At the center of the island is Mount Wai'ale'ale - 5148 ft above sea level and famed for being the wettest recorded place on the planet. For many, Kauai's north shore represents what a tropical Hawaiian paradise looks like. Mountains with waterfalls, lush valleys, and miles of palm fringed beaches. The weather is ideal for growing fruits and vegetables and a fair amount of land is set aside for small farms. The rugged mountains of the Napali coast, accessible only by foot, extend for 12 miles along the northwest section of the island. The north shore is sparesly populated (perhaps 6,000 residents), but the small towns of Kilauea, Hanalei and the resort community of Princeville provide a variety of nice restaurants, shops, and markets. The North shore receives a fair amount of rain, and far away storms in the North Pacific send big waves to the coast in the Winter months. This is an exciting time for surfers, but the rough ocean conditions also make several favorite snorkeling and swimming spots unusable except during lulls in the surf. In the summer months calm ocean conditions prevail. Kauai's east coast is the busiest section of the island and where most residents live. 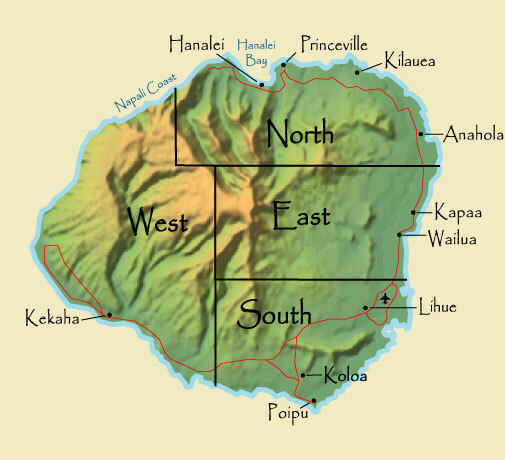 This area is considered "central" because it’s roughly the same distance to the north and south shore’s attractions (the highway doesn’t circumnavigate the island – it ends at the Napali coast). Here you'll find several small shopping centers, restuarants, and some interesting beaches including Lydgate beach park - one of the safest places to learn how to snorkel or swim. Lihue is the capital of Kauai but the towns of Wailua and Kapaa are the tourist epicenters of the east coast. 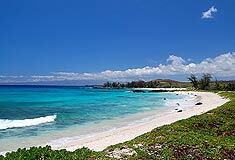 Kauai's south shore is defined by the Poipu resort, Kauai's most popular tourist area. 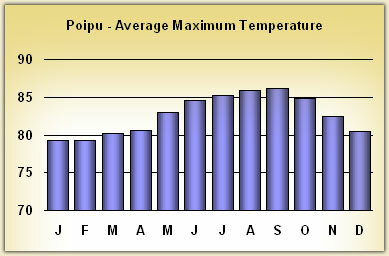 Drier weather, several nice beaches, 3 hotels and a large selection of condos contribute to Poipu's popularity. Just north of Poipu is Koloa, a small town dating back to the plantation era that now hosts a variety of tourist shops. Further north is the residential town of Kalaheo. 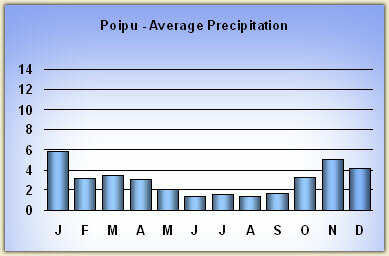 Some of Poipu's charm comes from the fact that sections of the coast here remain undeveloped. As required by more recent Kauai building codes, you won't find a building higher than a coconut tree (4 stories). 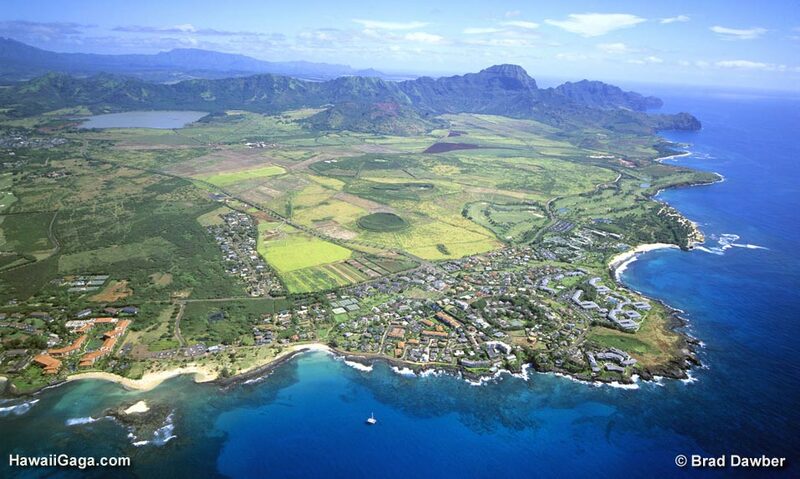 Kauai's arid west coast is mostly undeveloped. 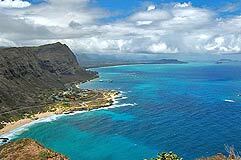 Two attractions in this area stand out - Waimea Canyon and Polihale State park. Waimea Canyon, coined the Grand Canyon of the Pacific, is yet another wonder of the Hawaiian Islands and a must see attraction. Remote Polihale is Hawaii's longest beach - stretching for 12 miles from Kekaha until the start of the Napali coast. Unfortunately a military installation (The Pacific Missile Range Facility) is based on a section of the beach, making that part inaccessible. The town of Waimea is located here. This is where Captain James Cook first set foot when he discovered the Hawaiian Islands in 1778. The following six factors tend to be most important considerations in deciding where to stay. Kauai's north shore is one of the most scenic places in Hawaii. The Hanalei Mountain range can have a dozen waterfalls flowing after heavy rain. It's always green on the north shore. A view of the north shore from Princeville. Hanalei Bay and town are in the distance. Poipu has a unique beauty of its own. There's a large section of undeveloped coast, so despite being the tourist hotspot of Kauai the area doesn't feel cramped, crowded, or over developed. You'll find plenty of green pastures and open spaces. The eastern section of Poipu, from Poipu Beach Park to Shipwreck Beach. While driving through Wailua and Kapaa on the east side you may be distracted by all the traffic. But turn up one of the streets toward the mountain and the scenery quickly turns rural. Here you'll find waterfalls, farms, the Wailua river and lovely mountain hikes. The famous gates from the movie Jurassic Park are located toward the base of Mount Wai'ale'ale. A portion of Kapaa in the foreground and Wailua in the background. Waipouli Beach Resort is front and center. The dry conditions on the west side of the island create a landscape that's completely different. You'll get glimpses of the canyon's gorges as you drive past sleepy little Hanapepe, once one of Kauai's most vibrant towns and even boasting two movie theatres. Historic Waimea town is the gateway to the Canyon and Kokee state park where you'll find remarkable scenery and miles of hiking. Waimea is perhaps Kauai's most "Hawaiian" town, but there are very few tourist accommodations in this region. 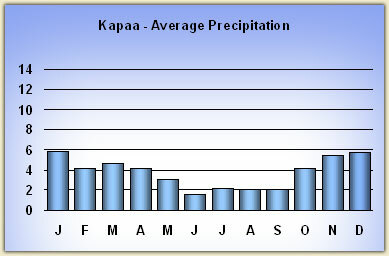 Getting a grasp on Kauai's weather is difficult. Mt. 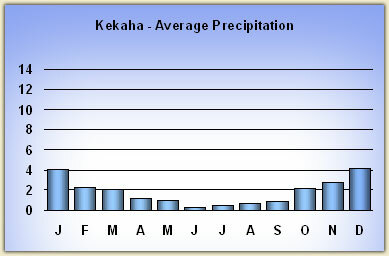 Wai'ale'ale receives over 460 inches of rain per year and yet Kekaha, situated 20 miles to the SW, receives only 20 inches per year! This contradiction is due to the fact that the trade winds blow fairly consistently from East to West. Clouds collide with the mountains and in doing so are trapped until they release their moisture. 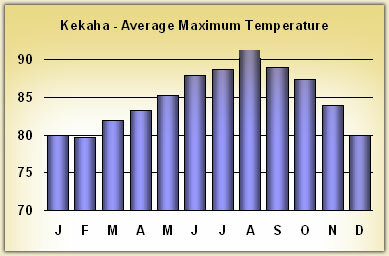 Hawaii only differentiates between two seasons. Summer lasts from May through September and "winter" claims the rest of the year. For summer time travel you don't have to factor in the weather in deciding where to stay. For winter travel the decision becomes more difficult. On average 60% of the rainfall occurs at night. Hawaii gets between 2 - 7 major storms per year. During a storm the entire island can experience bad weather for several days or even a week. In winter the wind blows from the south about 30% of the time, reversing the normal trade wind pattern. During these times the north shore will often experience better conditions than the rest of the island. These Kona winds are more common mid winter. Of the popular tourist areas, Poipu has the best weather on Kauai, so if sunshine is a major consideration select the south coast for winter travel. This is particularly true for November and March. Stay for as long as you can, so that you can experience the "average" weather. Visiting the north shore for only a week during the winter is a gamble. If you're lucky you'll have a full week of good weather, but if you're unlucky you could see a week filled with several rainy days. By staying for a longer period you're more likely to experience an average weather pattern which will include plenty of nice days. 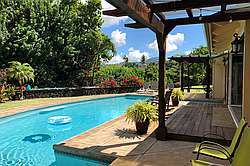 Kauai has a great selection of vacation rentals including a large number of vacation homes. Even Poipu, the most popular and expensive side of the island, has excellent rentals for around $150/night in low season. 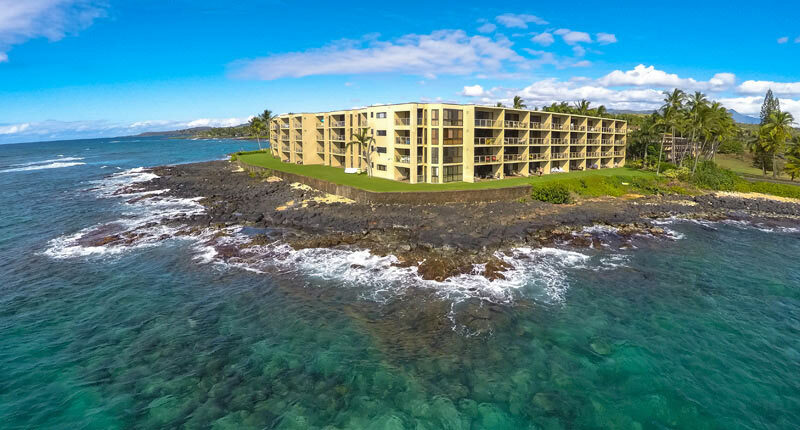 Take a look at our separate interactive condo guide to help you find a condo that matches your preferences, or our Kauai rental search page to see rentals (including homes) in different areas. 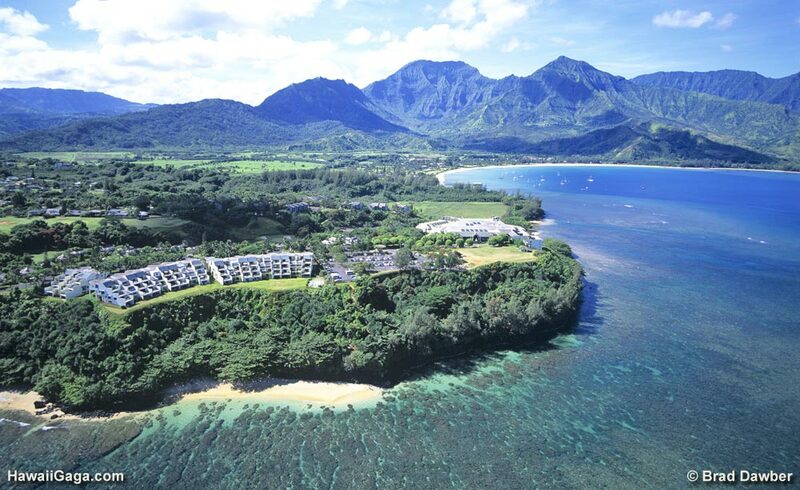 There are only two 5 star hotels on Kauai - The Grand Hyatt in Poipu and the St. Regis in Princeville. 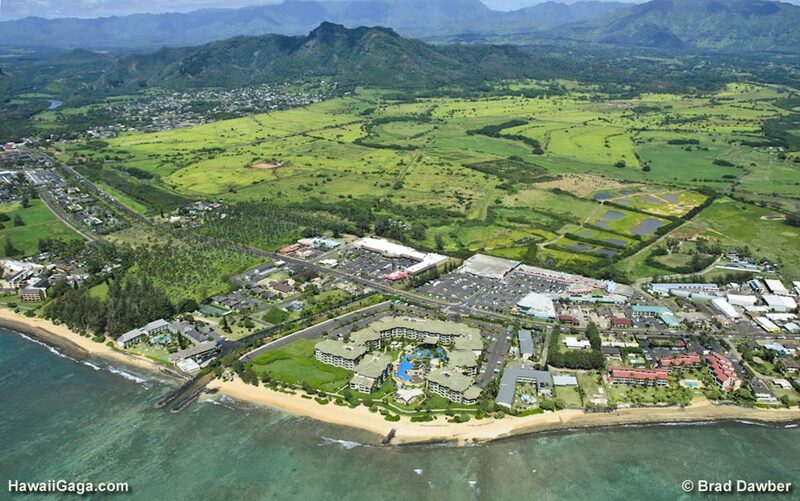 The Kauai Marriott Resort in Lihue is a good choice for a nice hotel in a central location. The Sheraton and Koa Kea in Poipu are two other good options. If you look at our interactive map of Kauai you'll notice many attractions scattered throughout the island. There are excellent hikes everywhere, waterfalls on the east side, snorkel spots in the south and north, many beaches on the north side, the must visit canyon on the west (which ends at the Pihea trail overlooking the Napali coast), botanical gardens in the north and south, etc. etc. For a vacation that includes a lot of driving and exploring, consider staying on the east side which represents a central location. But remember, Kauai may be a relatively small island but you won't be able to experience everything a region has to offer with just a day trip. For this reason it's best to either situate yourself in the area with the attractions that you like the most, or to stay on the east side so that you can easily accommodate a flexible itinerary - one that will change depending on weather, surf, and you what you feel like doing that day. The north, south and east each offer a good variety of tourist activities including zip lines, ATV tours, airplane and helicopter tours, horseback riding, boat trips etc. See our Kauai activities page for more information. A popular summer time activity is boat trips along the Napali coast. They normally operate from June through September when the north shore has calmer ocean conditions. In the winter time whale watching tours are possible on the south shore. Peak whale watching season is from December to April. If you take some time to peruse our Kauai Beach guide you'll notice many interesting beaches, particularly on Kauai's north shore. Here you'll find a beach for every taste including secluded beaches, surf breaks, and snorkel spots. But as explained below, the north's beaches are fickle in the winter. On Kauai the character of the ocean changes dramatically between seasons. Far away storms in either the northern hemisphere (winter months) or southern hemisphere (summer months) send powerful waves across the ocean where they finally make landfall on either the north or south shore. Most northern beaches have a dual personality, often placid in the summer and very active in the winter with something in between in the spring and autumn. The same holds true for south shore beaches in the summer months, except the shift is less dramatic. East facing shores experience more consistent conditions, but both east and west are subject to wrap-around surf from the north or south. Eastern shores are often active and choppy due to wind-waves from the trade winds. Ocean swells typically persist for a few days at a time and result in waves that vary in size from a few feet to over 25 feet depending on the severity of the distant weather system that produced the swell. In between swells the ocean will be calmer for several days at a time, subject to mostly localized wind waves. As the season transitions from winter to summer the waves start getting smaller, and the length of time between the arrival of new swells increases. North Shore - Average Biggest and Smallest Waves Experienced each Month. 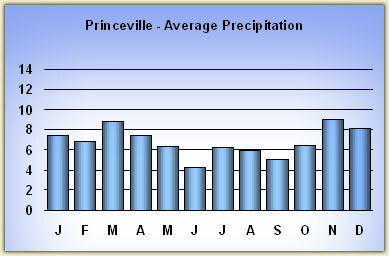 Data from Patrick Caldwell, Waimea. So how often can one swim or snorkel on the north shore during the winter? Hanalei Bay is the north's main swimming, surfing and boogie boarding beach. The shape of the bay and reefs protect certain sections from big surf, particularly the area near the Pier (known as Black Pot Beach Park). Likewise Anini beach can offer swimming even in big surf, depending on currents, because reefs cause the waves to break far from the beach. But other popular north beaches are more exposed to open ocean, and there swimming is only possible on small surf days. Heavy rainfall can also render many north shore beaches un-swimmable for several days. Streams and rivers carry man made pollution into the ocean. Heavy rainfall can result in flooding which leads to sewage leaks and overflowing cesspools, creating brown water conditions that can take several days to clear up. Tunnels beach is one of the main snorkel spots on the north shore. This beach features two reef formations. Snorkeling is done at the inner reef nearby the shore. The outer reef offers another barrier of protection against waves, so Tunnels can still offer snorkeling in modest surf conditions. 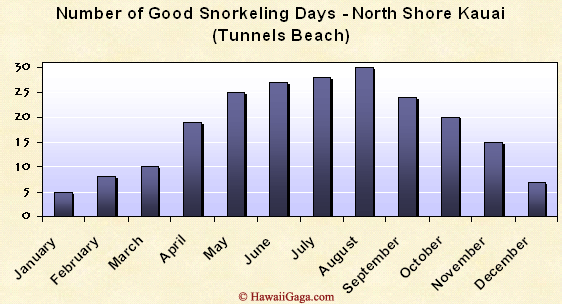 The below chart will give you a rough idea of how many days are "snorkable" at Tunnels beach in the Winter. The east coast has a few picturesque beaches but they're more suited for walking. Conditions tend to be poor for swimming due to currents, shallow reefs, and rocks. Possible swimming beaches include Lydgate Beach Park with its manmade tide pool, Kalapaki Bay which has the protection of a harbor, and Kealia beach. The south shore doesn't have the selection of beaches that the north has but they do offer all the activities beach-goers love, from surfing and boogie boarding to snorkeling and exploring. And they're not as subject to weather and big surf. This video gives you an idea of what they look like. In conclusion, if beaches are an important factor in your decision of where to stay, consider the north shore, particularly in the summer months. You'll find many beaches that are un-crowded, and even some that are barely visited. The south shore's offerings are smaller but more consistent and reliable. For the surfing enthusiast interested in the north shore, consider the shoulder months of April, May and October for great conditions. There are two resort areas on Kauai: Princeville and Poipu. 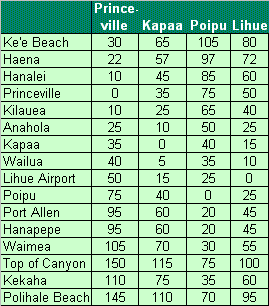 When we talk about staying in the north or south, we're really discussing Princeville and Poipu since the majority of visitor accommodations are in these areas due to strict zoning regulatios. As resorts, Princeville and Poipu are quite different. Princeville is a planned community that includes newer homes, many condo complexes, two hotels and a golf course. 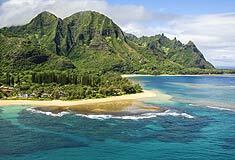 The community occupies about 2 square miles and is situated on a small cliff with the ocean on one side and Hanalei Mountains providing the backdrop to the south. 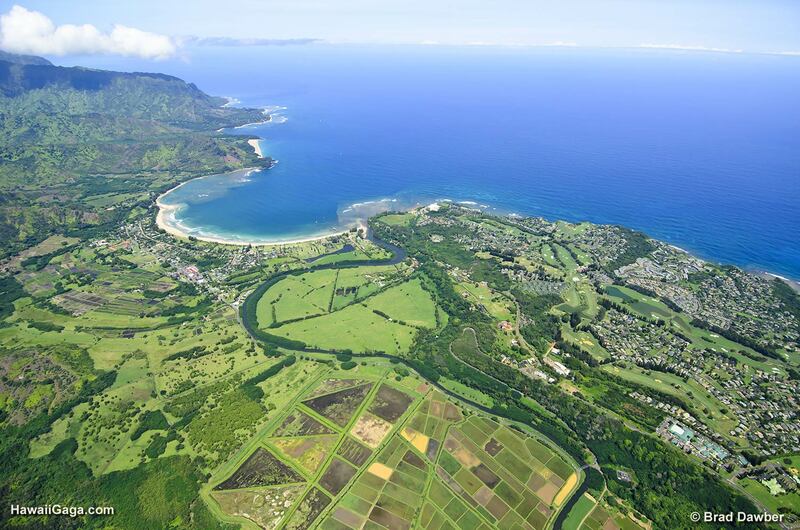 The town of Hanalei and Hanalei Bay are a 10 minute drive west, while the town of Kilauea is 10 minutes to the east. 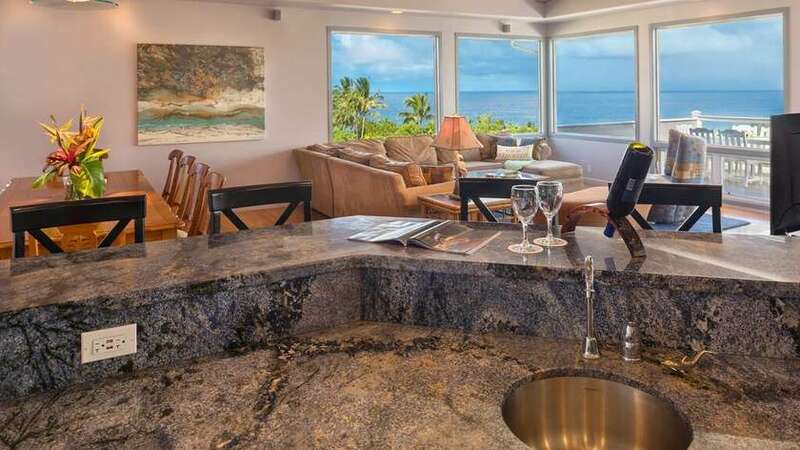 The cliff side positioning means that no accommodations in Princeville are beachfront, except for the St. Regis hotel which terraces down to Puu Poa beach. Although there are 4 small beaches in Princeville, most beach loving vacationers prefer to spend the day at one of the many larger beaches in the region. Princeville has an enclosed, slightly "exclusive" feeling with a welcome sign that reminds visitors that all roads are private. Fortunately the entrance post is no longer manned, but the Princeville association still patrols the streets looking for parking and other community violations. The formal, manicured atmosphere of Princeville contradicts the north shore's distinctly mellow, shoes optional, hippy type of vibe but does provide a postcard perfect look. There are a handful of restaurants but most vacationers drive to Hanalei for dinner. Poipu stretches across roughly 4 miles of coastline. Here you'll find a combination of old and new homes, 3 hotels, many condos, two golf courses, a fitness club and two tennis facilities, and a couple small shopping complexes. Koloa town, which dates back to the 1800s, lies a couple miles north of Poipu and features souvenir shops, eateries, grocery shopping, and a post office. In contrast to Princeville, most accommodations in Poipu are walking distance to a beach and restaurants, and all the hotels are located on a beach. Several condo developments have units that are less than 100ft from the ocean. It's possible to vacation in Poipu without a rental car, although one would never willingly do so as the island has so many attractions to explore. The convenience and proximity of shops, beaches, and accommodations means responsible teenagers who have been educated about ocean safety can be let loose in Poipu while parents partake in more relaxed activities (a visit to the botanical garden, rum tasting, or coffee plantation tour for example). In Poipu you can rent a condo 50ft from the ocean! The towns of Kapaa and Wailua on the east side make no pretense of being built for tourists. There's little detectable foresight into either town's development. For some travellers this is a refreshing sight as you'll feel like you're staying in a more "local" area, as opposed to a place created for tourists. A 4 mile long bike path runs beside the ocean in Kapaa making for a wonderful way to explore the coast and visit shops and restaurants. There are plenty of inexpensive places to eat and a handful of unique health food choices as well. If you're still unsure about where to stay feel free to send us an email with your questions. 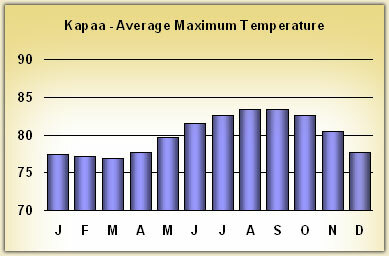 Remember to take a look at our interactive Kauai condo questionnaire which will give you a good idea of condo options.